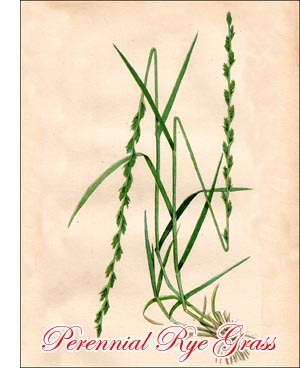 Other English names: English Rye or Ray Grass, Common Darnel. This grass is perennial with a creeping rootstock from which bunches of leafy stems and sterile shoots develop. The plants thus grow in spreading tufts, which consist of minor tufts connected by the elongated branches of the rootstock. The stems are strictly upright or more or less knee-bent ascending. They are slender, smooth, and generally one or two feet high. The leaves are usually dark green and folded together when in bud. In this respect they differ from those of Italian Rye which are rolled in the bud. The flowers are arranged in a characteristic spikelike inflorescence, composed of a number of flattened spikelets in two rows. The spikelets are solitary at each joint and the spike is therefore somewhat similar to that of Western Rye and Couch Grass. In Perennial Rye, however, the spikelets turn their narrow side toward the main stem, whereas in Western Rye and Couch Grass they turn their broad side toward the stem. For this reason the spike of Perennial Rye becomes strongly flattened, those of Western Rye and Couch Grass being more cylindrical. A spikelet contains from five to nine flowers, each enclosed within two awnless glumes. Perennial Rye Grass is indigenous to almost all Europe, northern Africa and the temperate parts of Asia. It was introduced into Canada and the United States and is now widely distributed, especially in the eastern provinces. It occurs naturally in waste places and cultivated fields, on roadsides, in meadows and along borders of woods. It prefers moist, rich clays and loams and in suitable soil the growth is luxuriant. It can be successfully grown on marshy land or on any good, well-drained soil. Stagnant water has a disastrous effect upon it. It becomes tough and wiry on dry, sterile soil and generally disappears after the second year. Although able to stand considerable drought, it cannot be recommended for districts where the summer is hot and dry, and for this reason it will never be of importance for the Prairie Provinces. As it loves a moist climate, it may be of some value for the Maritime Provinces and the Pacific slope, especially on heavy soil of good quality. Perennial Rye Grass is sometimes rather difficult to start. This is, however, not a general characteristic; it is often due to poor seed. If conditions are favourable and the seed of good quality, its development is rapid and a good growth can be obtained in a few weeks. It reaches its maximum yield the year after sowing but may continue to give fair returns for several years. It is one of the oldest forage plants of the Old World. It was cultivated in England almost two hundred and fifty years ago and is highly esteemed in the countries surrounding the North Sea. Although of only medium yield and nutritive value, in some parts of Europe it is grown in preference to any other fodder grass. On account of its rapid development and short duration, Perennial Rye is useful in hay mixtures, pastures, or lawns where quick results are wanted while more valuable and permanent grasses are becoming established. Its greatest nutritive value is immediately before flowering. Being rather early, it should be mixed with other early-flowering grasses, such as Orchard Grass. Grazing should begin before the stems are too far advanced. Under favourable conditions it recovers quickly and keeps on producing green feed until late in the fall. It stands rough treatment better than almost any other grass, tramping acting rather as a stimulant. When used alone, thirty pounds of good seed are enough for an acre.